Thessaloniki is the second largest city in Greece and a vibrant year-round travel destination. The city is famous for its local cuisine and nightlife, while a walk in its streets will reveal you numerous archaeological sites and monuments. Thessaloniki is also an important departure point for the Greek islands from the north of Greece along with the port of Kavala. Thessaloniki has seasonal ferry connections with the Sporades islands, a group of islands in the northwest Aegean Sea that consists of Skiathos, Skopelos and Alonisos. 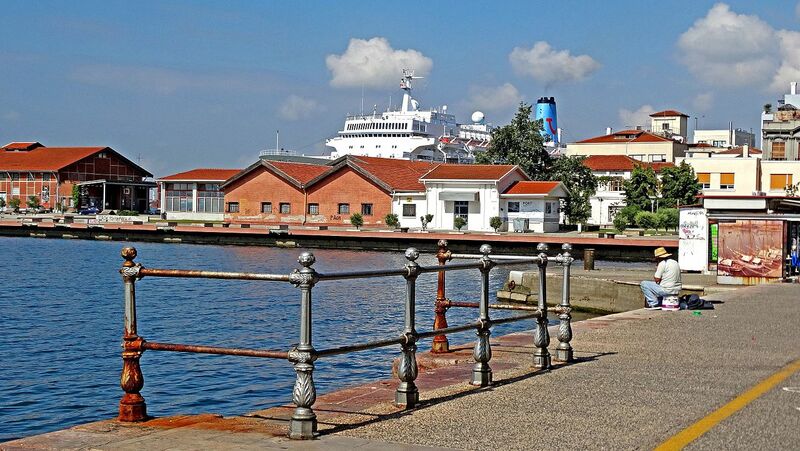 The port of Thessaloniki has also been serving ferry routes to Crete and the Cyclades.These itineraries though are subject to change every year so it is highly recommended to check the ferry routes on offer at Ferryhopper before organising your trip from Thessaloniki to the Greek islands. Thessaloniki connects with the three islands of the Sporades’ group during the summer months only. Approximately from mid-June until mid-September ferries depart daily from the port of Thessaloniki to Skiathos, Skopelos and Alonissos.The route is usually served by high speed ferries and the trip duration is 3,5 to 4 hours. During the summer, ferries often depart from the port of Thessaloniki to the islands of Mykonos, Naxos, Syros and other Cyclades islands. These itineraries usually operate with conventional ferries two or three days per week, although you should keep in mind that the schedules and destinations are not fixed every year. Overall, the trip duration from Thessaloniki to Cyclades islands is more than 8 hours, depending on the destination. The ferry connection between Thessaloniki and Crete is not a fixed one, but when the itinerary operates it is definitely one of the most interesting way to travel from the north to the south of Greece in one go. When the Thessaloniki to Crete ferry route is active, it operates only in the summer and usually twice a week. You should keep in mind that the long distance between Thessaloniki and Crete makes the ferry trip last a bit less than 30 hours. The port of Thessaloniki is one of the largest Greek ports and the largest in the northern Aegean. It also contains the second largest container-port in Greece, after the one in Piraeus. The port becomes more crowded during the summer months, and the passenger traffic is supported by the ‘Macedonia’ passenger terminal that is located 500 metres from the Thessaloniki city centre. The passenger terminal operates in a 24/7 basis and it has an Info Kiosk for any questions around your ferry or the port of Thessaloniki as well as Wireless access points and Duty free shops. The port of Thessaloniki is approximately 16km away from the international airport "Macedonia". There is a regular bus service operating between the airport and the Thessaloniki city centre while the distance is about 35 minutes by car or taxi. The port of Thessaloniki is located about 1km from the city railway station. If you are planning to combine your trip to the Greek islands with an exploration of mainland Greece it might be useful to know that Thessaloniki has a frequent train connection with many cities, including Athens or Volos. Thessaloniki has a wide bus network connecting the city with major cities and towns in Northern Greece, including the port of Kavala, as well as the south west of the country, including the port of Igoumenitsa. The distance between the port of Thessaloniki and the regional Bus Station is about 4 km. The local bus services connecting the Thessaloniki port with the city centre and other areas of the city, is frequent and easy to navigate. If you have some time to spend in Thessaloniki before your ferry departure or after your arrival, we highly recommend exploring the city centre, the area of the Castle or the east side of the city. You can find more information about the bus network in Thessaloniki, here. Organising your ferry trip from Thessaloniki is now made easier: Search all the available itineraries on ferryhopper and book cheap ferry tickets for your summer holidays in the Greek islands.